Conflab Corner: #Blogtober16 Day 12 - What's In Your Handbag? Well firstly, I'm not emptying out my handbag. That would be toooo scary. Plus I swap handbags around a lot so it's hard to say which is my current one. My phone is very rarely in my handbag. It's either in my hand or my back pocket so I can get to it. Where do the crumbs come from tho....? 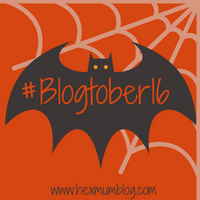 Follow the bat to find other bloggers sharing in Blogtober16. hehehe! I think if I had a handbag mine would be full of crumbs and old receipts too.